Lively cocktail bar with appealing food and a welcoming atmosphere. Past pavement-side tables and bright murals below ground, this George St bar opens to an appealing basement space. It’s popular with a varied crowd, thanks to a decent menu that offers good deals for tighter purse strings. The relaxed and friendly daytime atmosphere, accompanied by coffee and cold-pressed juices, livens up in the evening when a range of guest DJs and drinks offers (cocktails for £5 and beer or wine for even less) bring the average age down a notch. Wait staff are friendly and clearly care about what they’re serving – recommendations are plentiful, as are the choices. 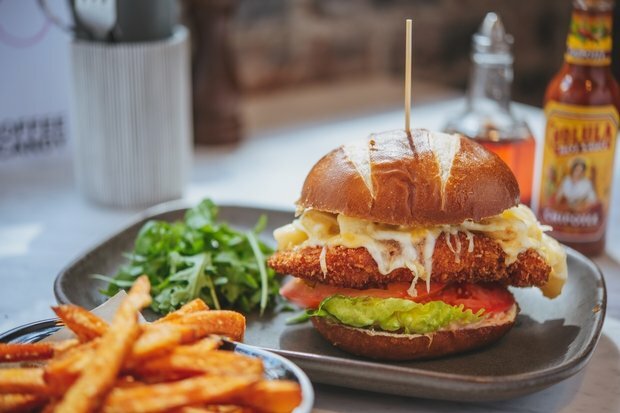 Bites (which come in threes for just over a tenner) include tasty crab cake poppers, hot wings in the kitchen’s tangy sauce and lettuce tacos for the health-conscious. Stone-baked pizzas are the stars of the mains, with genre-hopping toppings like crispy duck and hoi sin or chicken Caesar salad. Finish off with a hard shake and a shimmy to the funky music. Energetic urban eatery and subterranean drinking den. All day fast, casual and affordable food and drinks. Open 7 days a week for breakfast, brunch, lunch, dinner and late night snacks - Candy Bar & Diner is Edinburgh's newest all-day hangout. Live entertainment: DJs Wed–Sun, weekly quiz, big sporting events.